arrived here on a four-day official visit, mainly to attend the first summit of the Organization of Islamic Cooperation (OIC) on science and technology. 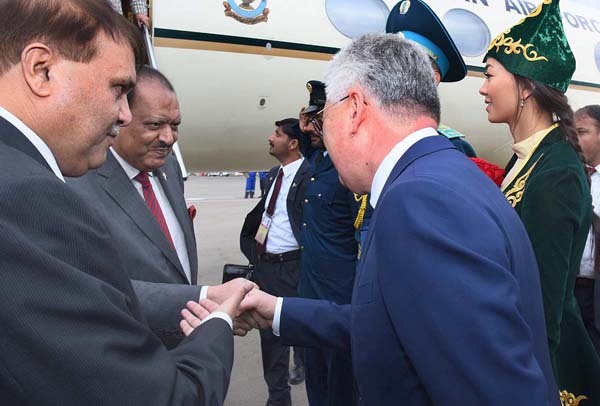 and First Lady Begum Mehmooda Mamnoon Hussain were warmly received by Kazakh Minister of Defence and Aero Space Industry Beibit Atamkulov and Deputy Mayor Astana Amanshayev Yermek. officials of the embassy were also present. followed the salute by the static guards. attending the OIC Summit would also attend the closing ceremony of Astana Expo 2017 on Future Energy. statements at the inaugural session of the summit being attended by the heads of state and government from around 22 Muslim states and delegates from around 57 states. Prime Minister of Kazakhstan, presidents of Turkey, Bangladesh and Bosnia.